If there’s one thing Britain does well, it’s rain: the Atlantic Ocean just loves to send rain clouds and storms rolling in form the west. And when it rains, that water has to go somewhere – which is why we have such an abundance of cool rivers and waterfalls on our damp and wonderfully-green little island. The Falls of Glomach may not be easy to reach, with an 8km trek through the wild Ross-shire countryside, but at 113m tall they’re one of the highest in the UK. Meaning ‘Fall of Snow,’ Sgwd Yr Eira plunges off a band of resistant gritstone on the Afon Hepste in the Brecon Beacons National Park. A public footpath actually runs behind the waterfall! It was nice to see some snow last weekend, and a cool waterfall. It might look small here, but this is just the end of a 180m long waterfall (the longest in England). More a cataract than vertical fall, Cauldron Snout’s 200m is considered the longest waterfall in England. It’s part of the river Tees, and is right on the boundary between County Durham and Cumbria in Northern England. The Afon Llugwy plunges over the famous Swallow Falls near Betws-y-Coed in North Wales. It is thought that the English name originated from confusion between the Welsh word ewynnol (foaming) and the similar-sounding y wennol (swallow). Ceunant Mawr (which translates as the ‘waterfall of the great ravine’) is just a few hundred metres from the centre of Llanberis along a convenient footpath, but with a drop of around 30m over two stages it’s one of the most impressive waterfalls in Wales. Tumbling down over 120m, An Steall Bàn (Gaellic for ‘the white spout’ is the second highest waterfall in Scotland, feeding in to the mighty River Nevis. 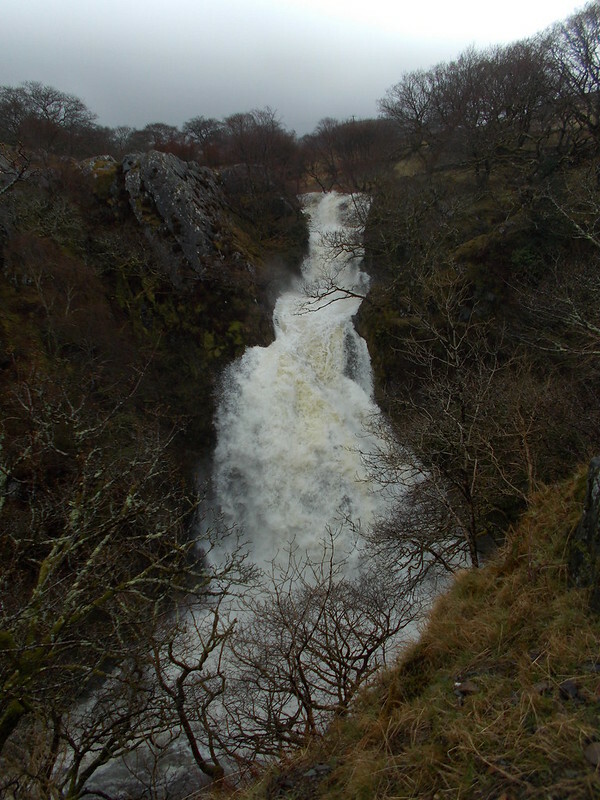 The 55m high Mealt Falls on the Isle of Skye are one of very few in the UK that plunge into an ocean (Sound of Raasay, connected to the Atlantic). On stormy days the wind can be so strong that it actually blows the water back upstream! Pistyll Rhaeadr is formed where the Afon Disgynfa thunders almost 80m over a cliff in several stages, including one unbroken 40m fall. Below the waterfall the river is known by a new name, the Afon Rhaeadr.